What is this? Why did this happen? Where did this come from? I understand that many of you have questions about Ponyo on a Cliff by the Sea, and many of you have come away puzzled about elements of the story. Never fear! As promised, I am opening this Ponyo Confusion Thread to answer all of your questions. I promise I will do my best to answer your plot riddles, without resorting to any cheap "it's only a children's movie" ploys. As always, I cannot claim to have all the answers, as there are many avenues for interpretation. This is where you come in, too. Let's all join together and share our thoughts and ideas about Ponyo. So, what you're telling me is that you're confused...by the confusion? Questions are scattered across a number of blog posts on this site, and a number of other animation websites. I'd recommend my "20 Observations about Ponyo" post, Cartoon Brew's Ponyo Thread, and Michael Sporn's Ponyo post. Actually, the only think I didn't understand was in the opening scene, when a big squid swims above Fujimoto and he points it with some kind of a light gun. is he communicating with it, the same way sousuke's father and mother communicate over the water later on in the movie? if this episode has no real meaning it seems a little pointless, but if it has the meaning of a secondary test, doesn't it seem poignant that fujimoto is willing to put himself in the role of the baddie for the greater good and out of love of his daughter? other ways to see this episode? @hidroapeiron: That's a good question; I wondered about that too. And frankly, I have no idea what he was doing. Maybe it's a way of communicating with the squid about... something? Ha, maybe with some more viewings I might get a better idea about it. I wasn't so much "confused" at anything in Ponyo, being pretty comfortable with Miyazaki's unconventional narrative style, but I'm very curious about a few things. I have some questions I'd like to ask Miyazaki about some aspects of the story, (the thing about the squid and Fujimoto's flashlight being one of them). I guess I'll just have to settle for asking all you "Ghibli Freaks" instead, haha. -Why is the character Lisa portrayed as being a rather reckless driver, all the while her child sitting in the car with her in the front seat? -Why does Lisa feel compelled to leave (some might say "abandon") the two children, Sosuke and Ponyo, alone in the house after the tsunami to check on the senior center? -Why is Lisa portrayed to be such a rash character? 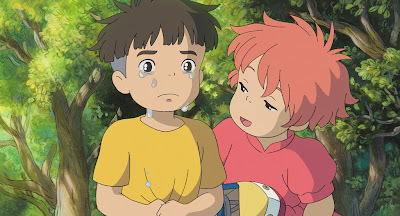 -Why does Sosuke refill Ponyo's bucket with tap water instead of sea water? Just so you know, I'm not really trying to pose these questions as criticisms. I'm genuinely interested in the creative process behind these narrative decisions, because I adore this movie. Any insights will be appreciated! I really loved that opening scene, with its densely packed life swimming, creeping, crawling around. The sight of the man in '60s Mod suit sending signals to a giant squid was especially impressive. Here's something you may not know about squid. Some species of squid and have transluscent bodies and communicate by changing their colors. "Caribbean Reef Squid have been shown to communicate using a variety of color, shape, and texture changes. Squid are capable of rapid changes in skin color and pattern through nervous control of chromatophores. In addition to camoflauge and appearing larger in the face of a threat, squids use color, patterns, and flashing to communicate with one another in various courtship rituals. Caribbean Reef Squid can send one message via color patterns to a squid on their right, while they send another message to a squid on their left." If you notice closely, you'll see that Miyazaki has populated his ocean with real life creatures. Now imagine how that looks to a small child. The magical and natural elements are one and the same through their eyes. Fujimoto is using his pocket light to communicate with the giant squid. What is being said? What are they telling one another? No one knows. Fujimoto is the caretaker of the ocean, and he tends to his garden carefully. Here's another thing that I find very interesting: this opening scene is the only moment in the movie where Fujimoto, the father, is truly happy. If not happy, he is certainly not grumbling or fraught with worry. He may appear bitter toward the civilization above, but he is devoted to his work. It's a portrait of the director himself - Miyazaki the alchemical wizard, who spins magic with paint and dreams of washing away the corrupt world of men. I'd also like to say something brief. I think there should be a degree of mystery in a movie, where people communicate things that are left unexplained. One excellent example is the ending to Lost in Translation, where Bill Murray whispers into Scarlett Johansen's ear. What does he say? That is left for you, the audience, to answer. Yeah, communication with the squid, that makes sense! What confuses me is that people who would visit this blog would even pose these questions. The film is magical and otherworldly. I don't need or want a Miyazaki "Pop-Up Video" that has to explain everything to death... I want an escape from explanations. I just want to experience. I'm not living in America, so I haven't seen the America dub (and probably will never see it), so I've only seen the Japanese DVD with English subtitles. Throughout the movie, Sosuke refers to Lisa (or should I say, Risa?) by her first name. He never calls her mom (or okasan) at all. There are no other references made. When I watched the film, I just assumed that Lisa was Sosuke's stepmother and that his real father was on the boat. However, from all the reviews of the American version, I see that Lisa is portrayed as Sosuke's birth mother. I just now checked some of the old information available when Ponyo on the Cliff by the Sea was first released here in Japan. They too refer to Lisa as Sosuke's mom. I wonder then why he refers to her as Lisa? This is doubly strange in Japan because children would never directly use their parents' first names. In American culture this would show a stepmother or stepfather. @Bionic - Well, let's be fair. They're asking questions because I told them I would answer them. It really just a way to satisfy my own curiosity. I really don't understand why so many - critics, especially - felt so lost and confused by Ponyo. Perhaps the Ghibli Freaks are just eager to dive into the deeper details of the movie. Or perhaps they're too accustomed to the same Hollywood formulas. Too many film critics are just out of it. I don't hold much hope for them. Ah, well. It's all part of life. I will do my best to answer all questions, just as soon as I get a good nap.....zzz. @BionicVapourDude: Your point is indeed well taken. Personally, I'm asking questions not because I'm confused or because I need explanations to enjoy the film, but because Miyazaki is an artist and infuses his movies (even "children's movies" like Ponyo) with deeper meanings and symbols, often from his own life experiences. I enjoy analyzing, discussing, and understanding these deeper meanings. Furthermore, my life's ambition is to become a film director myself, so I am keenly interested in the creative processes that lead to a masterpiece such as Ponyo. Thus it's important that I ask questions if I am to have any career at all. @Chris: I have also been wondering about Sosuke's form of address toward his mother. I haven't actually seen the original Japanese yet, but I noticed it in a Japanese trailer. I find it fascinating that he would call her by name, given the importance of formality in Japanese culture. This is one of those interesting nuances that you just don't get with the dub. 1) isn't the lack of nostalgia/elegy etc.striking for a miyazaki film? the film isn't taking place in the past or in some fantasy never-when, but right now, down to the cars and lisa's sassy 'tood. i guess this means the film will date in a strange way, and the cars that look like cartoon version of actual current models will one day look as funny as the high-cut jeans in "ocean waves". why was the design for the film made so absolutely current i wonder. 2) the film ENDS. the iris closes in in as wonderfully contrived a "that's-all-folks" ending as you could imagine. and the images withthe credits give us no clue as to what happens next, unlike various miyazaki films. Incidentally, I didn't mind the present-day slant this film employs, and I think setting it in today's world perhaps might bring home the message about the way we treat our waters than if it took place in the past (not that a future story would also have an impact). Having studied that lovely panoramic background, we do get a shot of Sosuke's house with him, Ponyo, Lisa and the grandmothers playing in the yard. I often think of this ending, as with some of Miyazaki's other films as having that "Life Goes On" theme in them. We like to know what the outcome might be, but this is all we have, and it's up to our conclusions as to how we may think the ending of the story might be. In some way, this is all we need, there might not be anything else to say that isn't there, so the ending is fine on it's own. It's true to argue it would be nice to see a little more of those guys, and I feel the same way too, but this is all we have to go by, so we just have to bare it and draw our own conclusions for now. @asuka: The final shot was a real surprise to me. A Looney Tunes fadeout? This whole movie is a grand tribute to hand-drawn animation and its rich history. And if the craft dies with Miyazaki and his peers, at least they went down fighting. @sean l: It's always great to learn how others interpret movies. All art is a two-way conversation, anyway. It's normal that these symbols will be read differently by different people. The question of the boy calling his parents by their first name is an interesting one. I'm telling myself to devote a post to that subject this weekend. Was this a reflection of a modern, liberal family? Was this pointing back to Goro Miyazaki? I think it's a good glimpse into this particular family, regardless. I'm a Miyazaki fan and I have many questions. Why did Ponyo lose her magic and turn back into a fish? Is it because she was human for too long? Her father said that by becoming human she would lose her magic. But he also said at the end she would be able to go between both worlds, as human AND fish. Does that mean she can keep her magic? @John L: We have to be careful not to take all this too literally (and also keep in mind we're referring to the english dub which may have different dialogue--or did you see the Japanese? ), but here's how I see it. I think it's Fujimoto (or Granmamare?) who says that Ponyo "cannot be human and magic at the same time." Furthermore, Granmamare told Ponyo that to become fully human she must abandon magic. Therefore, I deduced that when Ponyo devolved back into her fish form, it was because she had exhausted her magical abilities while maintaining her human form--this manifests itself also in her uncontrollable sleepiness. It is also apparent that Fujimoto is aware of this issue, since he mutters to the old ladies, "My hope is that Ponyo will stay asleep." As for the line about "moving between two worlds," I think that was actually Granmamare, and perhaps it is not so much suggestive of Ponyo's potential capabilities than it is referring to her fishy heritage. We should take a look at the wording and its context again to be sure we're interpreting it right, and I don't know yet but that bit of dialogue may be different in the original Japanese. One thing's for sure, though--the deal is that Ponyo will not have magical abilities when she turns fully human. Thanks Sean, that makes sense. I saw the English version, which might make a difference. I'm perfectly happy to accept the magical world as Miyazaki created it, though I also want to make sure I didn't miss something. There are so many ideas/themes in this film, it makes for great discussion. 1. Sosuke calls both of his parents by their first names: Lisa and Koichi. Not once is "mother" or "father" used by anyone to describe them. 2. Ponyo refers to her father also by his first name only, Fujimoto. She never says "father". 3. Ponyo calls her mother, "mother". This is the only character to be referred to as "mother". In fact, we never really learn her real name, as Koichi and his men call her the Sea Goddess and everyone else calls her "Ponyo's mother". It's all very interesting and seems absolutely deliberate, but I really can't figure out why. This is far from the usual case in Japanese society. It seems that in the American dub, he says "mother" and "father"? If so, that's kind of bothersome in a way like having a cat named Jiji suddenly talk when he shouldn't very well be saying anything. In addendum to my post, Ponyo's mother's name is, of course, Gran Mamere. Hey Chris, thanks for sharing with us what the Japanese version is like. Unitl the DVD is officially released in the States, I'm dependant on the Disney-dub theatrical release of Ponyo. I admit, given the known formalities of Japan, the fact that Sosuke calls his folks by their first names is something to take notice. From a working woman's perspective, I can interpret this as a way for both parents to not lose their identities in a solely child-raising role. Lisa is so obviously frustrated in being house-bound outside of work, that she takes it out on her absentee husband, through her driving, and her need to kick back with a Sapporo(?) beer. Being a "Mom" often means being taken for granted, and that gets REALLY tiresome after awhile. Chris, I was curious, when Sosuke is frantically calling for his mom near her abandoned car, does he still call her Lisa? I would think he would slip back to some version of "Mommy" at that point, given how upset he is. Just wondering. @toongirl: I can answer that. In the Japanese soundtrack, Sosuke only calls his parents by their first name. This is one of those things that a lot of Americans ask about. Here's my best guess: either Sosuke's family (aka the Miyazaki clan) is just modern and avoids the old formal titles; or Miyazaki wanted children to feel grown up and in charge. What better way to show, "I'm a big kid," than by using first names? Push comes to shove, I'd say the latter is the best explanation. Miyazaki wanted a warm and friendly atmosphere for children in this movie. You're smart to notice that Lisa, the Wife, is not happy at being stuck at home. This was not a part of the bargain, and she's been forced to sacrifice her career for the sake of her husband. In other words, this is a personal portrait of the Miyazaki household. "Gran Manmare" is never used in the Disney version. But it's only spoken once at the very end in the Japanese version. Perhaps audiences would be confused. "Gran Manmare" is a play on French words meaning, "Mother of the Ocean." Toongirl asked me the question, Daniel! I wanted to answer it!! The ending really does puzzle me. If Fujimoto was taking Sosuke, Toki, & Ponyo to Gran Mamare, why did his daughters intervene? It seemed they just shoved his assistance aside and left him standing in the sidelines for the rest of the film. My one guess that makes sense of this scene is that he was planning to take Ponyo away so she would not end up as sea foam. I'm all ears to anyone else's interpretations of this scene. This discussion has been interesting to read! I have trouble understanding many movies, which often bothers me because I always want to accurately understand what an artist is thinking when he makes something, but I think maybe with Miyazaki films it's actually kind of appropriate. Maybe he makes them so mysterious because he likes the idea of his audience beholding them the way a little kid would: just watching and wondering. PS I think maybe Sosuke calls his parents by their names because it's not really Japan. It's a different world where there are big crazy fish all over, and no characteristics defining it as a real place. So maybe Miyazaki was just doing whatever he wanted, and he wanted parents to be called by their names in his Ponyo world, which makes sense from the POV of someone writing a character, I think, because it makes them more real-peopleish instead of just parentish. Maybe something like this about 'Spirited Away' could be started, because that movie is just full of unexplained weirdness. I watched it again recently and forgot how much detailed ugliness it had compared to some other Miyazaki films, it almost seems like Miyazaki worked with someone else on it. It's pretty different for him. That's a very good idea. We might have to take that up sometime. Hopefully, I'll be able to write about that film, and all the other ones, and at least explain my own points of view. I think that the gaps and ambiguities are the films strength rather than its weakness, it is the spaces in between scenes and unfulfilled tangents, what many people have called 'plotholes' or 'inconsistencies', that are the key to understanding the subtext. I think the director is playing with lots of structural elements that don't reveal themselves in the dialogue or even necessarily the way the characters act, and for this reason they don't need to be be asked to occupy the same roles as in former films. There are lots of binary oppositions that operate in the film like land/ocean, male/female, human/unhuman(fish, god, wizard), day/night, sun/moon, father/mother, young/old, etc. All of the the things that come first in these opposites are Same to us, they are familiar and establish a positive relation to our life. The things that come second are Other and are unfamiliar and mysterious, establishing a negative relation. I think the film demonstrates that we divide our world arbitrarily into opposing categories which may lead to negative social consequences, ie. environmental catastrophe by treating the ocean as lifeless Other, a resources for exploitation by us humans on land (the Same). The film shows that distinctions all meld into each other, the school and the old folks place are connected, old and young are the same, the sea and ocean merge and interact, male and female become united in common cause instead of separated by gender specific roles, but this merging into a higher 'truth' of life can only come by some violent upsurge because we have made the world so out of whack by putting up fake differences. The wizard father guy says it himself: 'we must restore the Natural Balance'. There's probably a lot more to it but just from this we can see this is not a lightweight movie at all, in fact its one of Miyazaki's best i think, more subtle in its power than most can see. So, Ponyo just came out on DVD here in the states, and I noticed in the Japanese version how Souske calls his parents by their first name. My interpretation was that Souske was adopted recently. Maybe his true parents had died a few years back? I also have a theory about Lisa. Her name doesn't seem like it'd be common in Japan, though of course I don't know that for sure. Also, she's very hot-headed and a reckless driver, and, though I don't know a lot about the Japanese language, her accent seems really harsh, similar to the American pilot in Porco Rosso. So...maybe Lisa's an American? Perhaps she married the ship captain, moved to Japan, and ended up adopting Souske. For me, that explains a lot about the relationship between the the three of them, and gives the film that extra layer of depth Miyazaki always slips in. @Matthew: It is very unusual for the child to call his parents by their first names. He does seem to get along with them, so it's not animosity. In Jarinko Chie, for example, Chie calls her father by his name, Tetsuo, instead of "father," because she really doesn't like him very much. The question of the boy using first names has been asked before. In the end, I don't know why it is. I don't think any hidden meaning is intended; Ponyo's intended audience is a 5-year-old child. Perhaps that's the real reason? Perhaps Miyazaki wanted children to think of the grown-ups as friends? Remember that, in my view, at least, this family is actually the Miyazaki family. Father is out away at work, and Mother has to sacrifice her career in order to raise the children herself. Doesn't Lisa's driving seem overly aggressive? She has a lot of pent-up energy that's not getting out, and it is only released when she's driving. There are a couple essays in Starting Point that address the Miyazaki clan. I'd suggest reading that book if you haven't done so already. Thanks for the comments, as always! It's greatly appreciated. I have a comment on all the questions about why Sosuke calls his mom "Lisa," not mom....it could be completely unrelated to Miyazaki's intended reason, of course. I have a half Japanese friend whose parents got divorced, and she originally lived with her mom in Japan. However, she got badly bullied so her mom sent her to her dad in the states when she was 6. To this day, if my friend try to call her mom "okasan," her mom corrects her and says "call me Aikiko." Why? "I don't deserve to be called mom." I don't think the movie is saying that they are bad parents, but it's POSSIBLE that because the parents are not fulfilling "traditional" parental rolls, their first names are used to highlight this fact. Titles/names are very important in Japan (I'm currently in Kyoto ^^). i did find lisa to be somewhat suicidal, but she seemed strong and loving so it was forgivable. it was frustrating the dub changed her desagnation from lisa to mom- almost to say: the japs got it wrong!- this is what you call your mom! (sadder still they used the japanese sound track when suske cried after loosing ponyo- that is WEAK!- i can imagine the kid literally saying BOO HOO!- scrap it, just use the original- nice to now the kid made the effort) when it comes to this sort of thing- it usually goes over my head so i feel enlightend now. but see it or not in the film, we allready know sociaty is more screwed than a mecharno set. Maybe Sosuke and Ponyo refer to their parents by their first names because Miyazaki wanted to establish them as equals, if not authorities, to adults. The film is about children after all - it would make sense that its world is inherently ruled by the young or young-minded. They were the ones who innocently cause the havoc, and then were able to set right in the world in the end. @chris - I believe its gigi from kiki's flying delivery service. I think Sosuke and Ponyo referring to their parents by their first names has more to do with Gran Manmare than anything. Miyazaki has made many movies about the environment, often with spiritual or mystical aspects. In Ponyo the only one refered to as 'Mother' is Gran Manmare, the Mother of the Ocean. It's stated that the ocean is where all life begins, and there's a a highlighting of the trash and pollution in the bay. @Asuka That's a really great observation, I hadn't seen those moments as Sosuke's test. 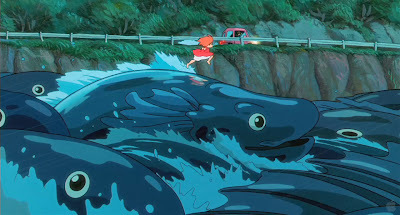 I think the reason Sosuke run's from Ponyo's father is to highlight the way he was pushed them away with his fear. It's very fitting that Toki is there too. For both of them their fear is standing in the way of what they need. Fujimoto wants to help but is so full of fear that he scares Sosuke away. Toki can't find her own peace because she is so fearful and untrusting, and her fear based actions almost end up hurting Sosuke and Ponyo too. On another note, I think Lisa's recklessness could be interpreted as a fearlessness and a deep sense of trust. She's clearly upset about Koichi not showing up as a father, but she seems like a loving comfortable mother to me. If you notice her driving isn't just reckless, really is fearless (the scene with the ship for example). It takes a lot of trust to let your kid play down by the ocean by himself or to leave him alone in a storm to dare devastational weather to help the elderly. And her reaction to Ponyo is open and unwavering. She doesn't skip a beat. Whereas her acts if daring can be interpreted as recklessness, her calm in the face of the unknown clearly has nothing to do with being reckless. I believe she is an oppositational figure to Fujimoto and Toki. Thanks for sharing with us what the Japanese version is like. Unitl the DVD is officially released in the States. and now i show you a good site for you online shopping.